Our team is here to serve. Our goal is to give you the information you need to make educated decisions about your health – without the pressure. We are committed to providing natural options for treating your family’s health issues. 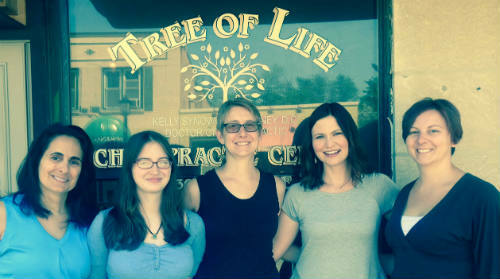 Here at Tree of Life Wellness Center, we work with families to help them understand that many chronic conditions can be helped with non-surgical reconstructive care, rather than routine prescription drugs and surgery. We work hard to help our Elmhurst families reach their health goals. You hire us to help you meet your health goals whether you’re looking for immediate relief care only or to achieve wellness. As our patients will tell you, they are very happy with their results! All too often, doctors forget what is important from the patient’s perspective. The philosophy of our office is designed with one point of view in mind… YOURS, the patient! Dr. Kelly has been helping children and adults experience life at their maximum potential through non-surgical reconstructive care for 12 years. We utilize gentle, non-invasive diagnostic testing of nerve, muscle and foot function right here in our office, with zero radiation exposure. Here at Tree of Life Wellness Center we work very hard to ensure that we have the most state-of-the-art technology available to treat and diagnose our patients. We want to make considering non-surgical reconstructive care easy on YOU! Why Choose Us to Care For Your Family? Dr. Kelly is a mom with kids who specializes in helping moms with kids. She understands both the medical perspective as well as the mom perspective. She has deep knowledge about chronic issues that are specific to moms and kids. For example, she can help you stop reoccurring ear infections through non-surgical reconstructive care, without the repeated doses of antibiotics or the stress. Helping children and adults experience life at their maximum potential through non-surgical reconstructive care for 13 years. She not only has the medical qualifications (D.C. – Doctor of Chiropractic) but also the people skills to help you reach your health goals. At our office, there is no obligation after your first visit: you determine if our office fits your health care needs. Gentle adjusting: no “cracking” sound. Most insurances accepted – we file for you. Care without the wait: get your family adjusted in between the soccer game and music lessons, without the stress. Child-friendly office environment: complete with books, crayons and activities. Exceptional service: patients are even greeted by name! We’ve been delivering quality non-surgical reconstructive care to the Elmhurst community since 2005. We work with our local community organizations by helping them with fun fundraising opportunities as well as educating the members of their organization on “hot topics”. If your organization would like to find out about our fun fundraising options (can you say “massage”? ), please contact our office for more details. We make it both easy and fun while helping you generate some much needed funds. To learn more about our professional and community organizations, please click here.